It all began with the churning of the ocean with the devas and the demons. The continuous churning of the ocean gave rise to the deadly poison “Kaalkuta poison” which was consumed by Lord Shiva to save the world, that is why he is known as the “Blue throated” (Neelkantha). Thereafter various other auspicious symbols were created from the ocean. The entire universe was dazzled by the glorious emergence of the queen of the ocean seated on a beautiful lotus flower carrying the divine pot of nectar in her hand. This was none other than Mahalakshmi. All were deluded by her exquisite beauty; their gaze fell upon her instantly. According to our scriptures the (puraanas) this prayer has been handed down from generation to generation. The lady known as Saarumadhi Devi had a vision one night where Mahalakshmi told her that she would manifest herself on the Friday proceeding the full moon day in the month of Aadi. The observance of her prayer should take place on this day. Saarumadhi Devi’s family, friends all came together and observed this Varalakshmi Viratham in a splendid way. From that day on, this prayer has been observed. What does Varalakshmi Viratham mean? •	Varam - blessings or gifts. •	Varalakshmi Viratham – is a fast undertaken in honour of the Goddess of wealth to secure a boon/wish and auspiciousness that brings gifts and blessings. •	A vegetarian diet should be observed for the entire day (on the day of prayer). •	The entire house should be cleansed (day before prayer). •	One should wash their lamp and dot it with borrie and kumgum (day before prayer). •	A korlam should be made at the front entrance of the house using either rice flour or mealie meal (morning of prayer). •	A garland should be made using fresh flowers and mango leaves if available. •	The garland must be hung on the door (morning of prayer). •	The prayer should be observed between 4.00AM – 6.00AM (morning) or from 6.00PM in the evening. •	A string should be made for each family member with or without 8 knots (day before prayer). First light your lamp before commencing your prayer (pooja).Ganesha should be made out of borrie (if one does not have a Ganesha murti). Place on a tray with 1 betel leave, 1 betel nut, 1 coin, 1 flower, some avaal kadaal and sugar candy, fruit, milk and prasadam , 3 incense sticks should be lit. Lord Ganesha should be invoked first by offering flower petals and chanting the mantra of Ganesha (Aum gam ganesha ye namaha) or (Aum gam ganesha potri) can be chanted 18, 27 or 108 times. After chanting camphor must be turned clockwise 3 times. Sprinkle water 3 times over the prasadam. After completion of the Ganesha prayer one should take camphor and proceed to the front entrance. The door should be open and camphor should be turned facing east for the (SUNRISE). Thereafter a flower should be placed on the korlam place a kuthu villaku or lamp on the korlam. Light the kuthu villaku or lamp. Camphor should be lit in front of the korlam. Offer some flower petals with rice on the korlam repeating the mantra (AUM SHREEM MAHALAKSHMI YEH NAMAHA OR AUM SHREEM MAHALAKSHMI POTRI (8 TIMES). Welcome Mahalakshmi into the house by carrying your kuthu villaku or lamp to your prayer place. Place white rice on a tray place lamp on white rice. Dot the base of the lamp with borrie and kumgum. Place a betel leave, betel nut, flower a coin some kumgum, borrie and kadam podi. Place your strings on top of the betel leave. Place fruit, milk and prasadam in front of lamp. Turn the coconut clockwise 3 times and break. Place the 2 halves on either side of the lamp. 8 Incense sticks and 1 camphor should be turned. Sprinkle water over the prasadam. 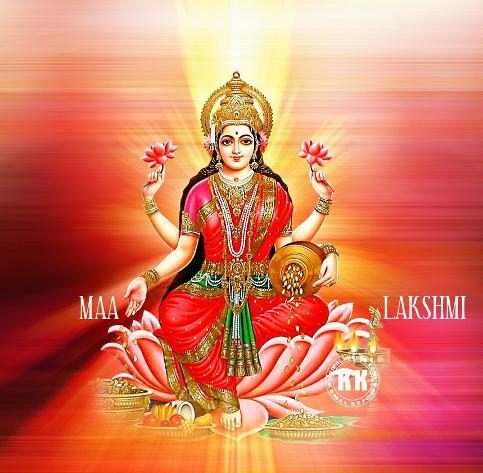 A song or a prayer can be sung or chanted in praise of Mahalakshmi. You should leave the prayer place for at least 5 minutes without any disturbance. Thereafter the red strings may be tied on the left hand for ladies and right hand for man. Place white rice on a tray thereafter placing a brass pot on the white rice. Fill the pot with water and rosewater or rice; take a betel leave, betel nut, 1 flower and 1 coin place it inside the pot. Light camphor and place it in the pot. Once the camphor has gone off take the coconut with 5 betel leave and place on the mouth of the pot spreading the betel leaves around. Place the red cloth around the coconut. A garland should be placed around the coconut. Place in front of kalasha 1 betel leave some kumgum, borrie and kadam podi. Place your strings on top of the betel leave. The lamp should be placed in front or on the side of the kalasha. After chanting the mantra 8 incense sticks should be turned and camphor should be turned. On the third day (Sunday) the coconut from the kalasha should be turned around the lamp and broken and placed on either side of the lamp. •	And is the refuge of your devotees. •	Salutations to you and you divine power.